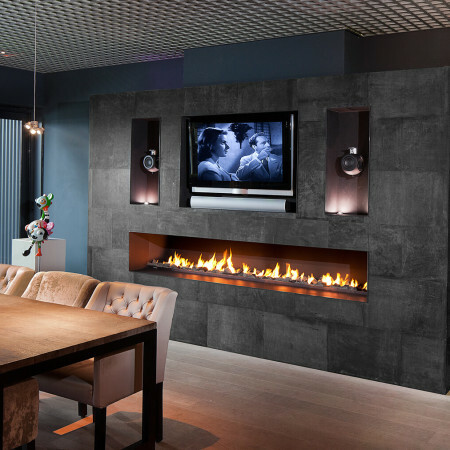 A wide designer high efficiency gas fire, with an overall width of 2m. 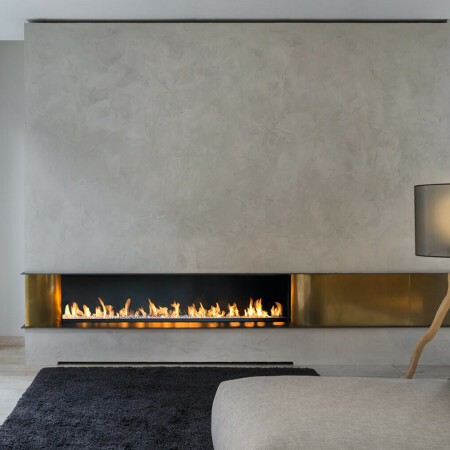 The beautiful, bespoke, bronze side panels provide an additional, luxury feature to this high efficiency gas fire and compliment this already impressive designer fireplace. If you’re looking for high heat output combined with elegant and minimalist design then this type of fireplace is ideal. The flames are completely enclosed behind glass meaning that all the radiated heat remains in the room ensuring maximum efficiency. We offer many types of high efficiency gas fires within our collection that are suitable for all kinds of situations with bespoke, decorative elements that can be added. To better understand what we can offer, please contact a Design Consultant.